No stranger to the columns of Seacoast Jazz Notes, multi-instrumentalist, composer and educator Chris Klaxton is one of the most ubiquitous jazz musicians on the Seacoast. When fans of the music fret about its future, we need only consider Mr. Klaxton’s passion for the music and his determination and ability to nurture the love of it in his own and subsequent generations to realize our music is in the very best of hands. 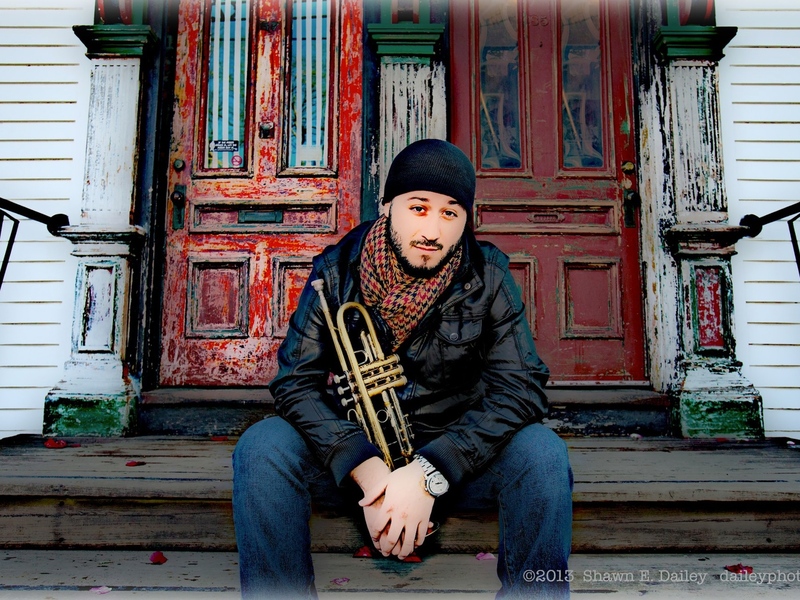 Chris brings to his career a rich and varied education in trumpet technique, improvisation, jazz piano/theory and composition. He earned his Bachelor of Arts degree with a major in Classical Trumpet at the University of New Hampshire. He then went on to the University of Miami, where he earned a Master’s degree in Music, with a focus on Jazz Trumpet. He has studied with Brian Lynch, Terence Blanchard, Jason Carder, Dr. Robert Stibler, Stephen Guerra, Whit Sidener, and Gary Lindsay. Perhaps the most significant and fortunate musical experience of Klaxton’s career, though, as Chris will tell you, was his relationship with the famed trumpeter Dr. Clark Terry. Years of study with the jazz icon, several years as his valet/travel manager, and more than a decade of friendship with him, has left Chris saturated with lessons and anecdotes (musical and otherwise). Chris is proud to pass on to a new generation a unique repertoire, a system of phrasing and rhythmic pronunciation, and a means of conveyance, just as it was handed down to him directly by one of the founding fathers of the music. As he’s established his jazz chops and credentials, he’s had opportunities to perform as a soloist alongside Clark Terry as well as another legendary trumpeter, Dave Douglas. Here on the Seacoast, Chris is active musically on a number of fronts, one of which, of course, is teaching. Right now, he’s a faculty member at the University of Southern Maine, at Plymouth State University, and at Portsmouth Music and Arts Center. As a performer and organizer, he presents a twice-monthly jam, which he’s dubbed "Oh No, It's Jazz! ", at Birdseye Lounge in Portsmouth. Not long ago he launched OURBIGBAND, a 17- piece jazz orchestra, which he performs in and directs regularly. He can also be heard as a participant in the experimental performing ensemble “In Ears and Eyes,” featuring live “jazz painter” Roger Goldenberg and examining the dialog between sound and sight. And, unafraid of venturing beyond the jazz boundaries, Chris performs and records with the indie rock band Tan Vampires, in which he displays his versatility, playing trumpet, guitar, percussion and Vox. As a recording artist and composer/arranger, Chris has produced two albums of original material under his own name, STARCODE and COLLAGE. He also records with Boston MCEE, with Moe Pope (voted Best Hip Hop Act in the Boston Music Awards of 2012 and 2013). And he has also recorded with the Henry Mancini Institute Orchestra for Pharrell Williams, Randy Bernsen (featured alongside John Medeski), Steve Grover, George Garzone, Christine Correa, Frank Carlberg, Allen Lowe, Matthew Shipp, and Michael Gregory Jackson. Chris also serves as Choir/Music Director at First Parish Federated Church in South Berwick, Maine. And most recently, he has been appointed by the New Hampshire Council on the Arts to the New Hampshire Teaching Artists Roster. Chris Klaxton. Keeper of the flame.